I’ve made many no-sew pillows before. I have usually adhered the sides together using fusible webbing tape. Easy peasy! But today I’m sharing how to make a no-sew pillow by gluing it together with a hot glue gun! Yup!!! Works perfectly! I’m thinking I just might be making all of my pillows this way from now on. It was so much more than easy! 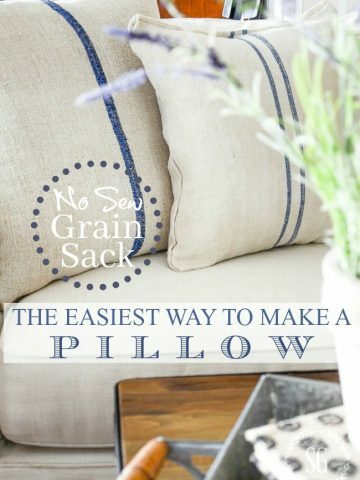 And the best part is that even if you are not crafty or a sewer or handy or a diy’er you can make this pillow! And it will look amazing! 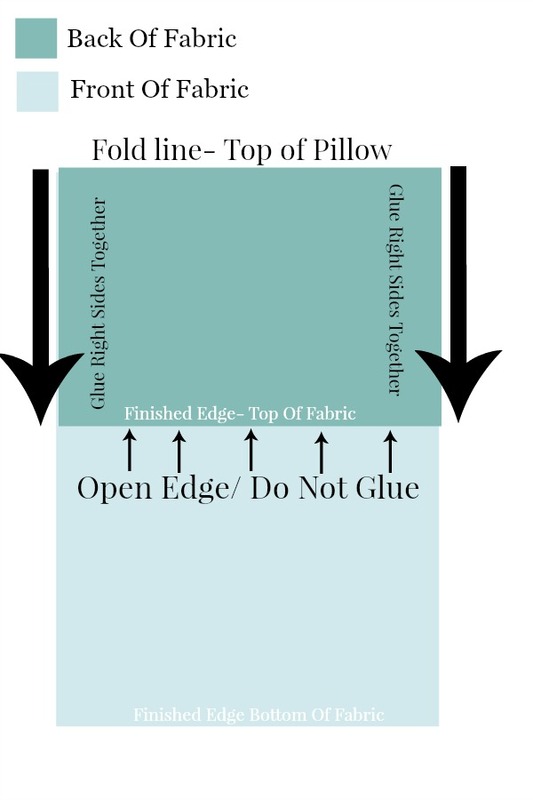 So let’s make a 10 minute, no-sew pillow with glue! 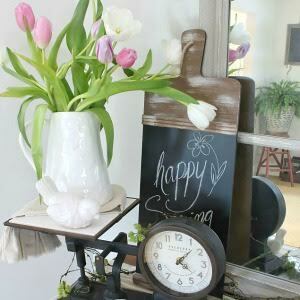 Today is 10 MINUTE DECOR, the spring edition. Please make sure to check out the great and easy spring ideas at the bottom of this post! I know it’s 10 MINUTE DECORATING today. And I thought I would be able to make this pillow in that amount of time but in full disclosure, it really took me about 20 minutes to make! But I had to figure it all out so it took a little longer. I bet you can make this pillow under my time because I have such detailed directions for you! Spring is a great time to put away all your heavy pillows and bring out light, pretty patterned pillows that are perfect for spring! 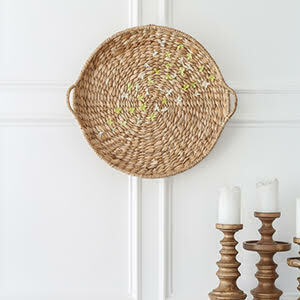 So let’s make pillows that work with our spring decor! I can’t tell you how easy this pillow is to make!!! A group of my friends was talking about pillows and someone asked if we thought a pillow cover could be glued together. And a lightbulb went on! So I gave it a try and now I know you can! I used an old curtain that I had been hanging on to for quite awhile. I love the linen fabric and the medallion motif. 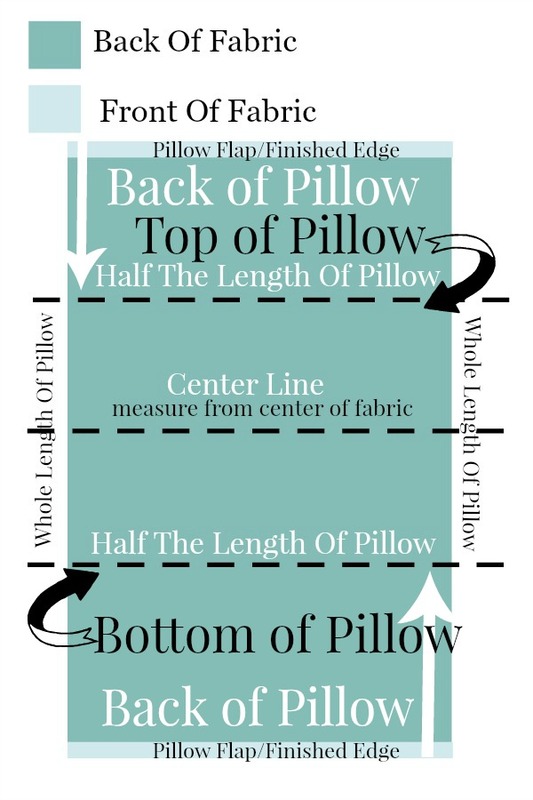 Pillow Length: Measure the pillow from top to bottom. Multiply that number x 2 and add 7 inches. Pillow Width: Measure the pillow width and add 1/2 inch. It’s probably easier to make a standard size pillow form. 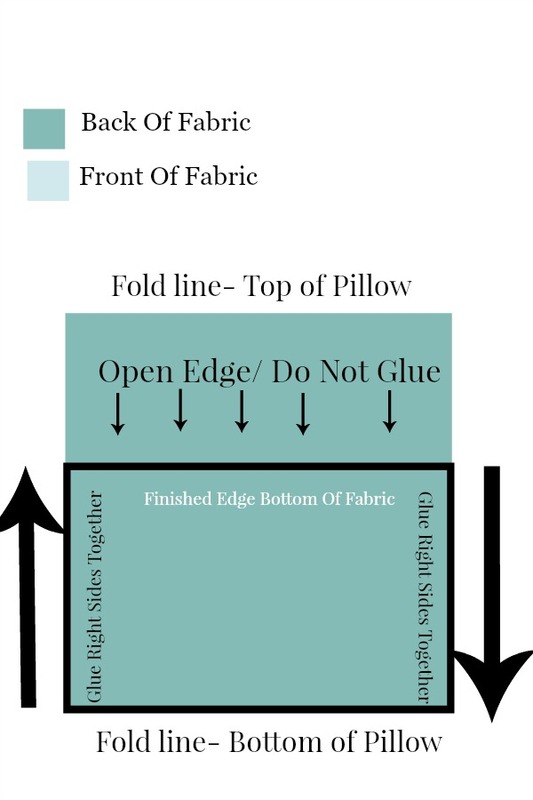 Put the pillow fabric wrong side up on a flat surface and follow the directions below. I make diagrams for this diy because it was hard to see the right side and the wrong side of the fabric in the photos. Now that you have the finished the top and bottom edges that will become the edges of the enclosure flaps, let’s go on! Fold the fabric according to the image below. You can hand fold them or iron them. These folds will be very helpful. Fold the fabric in half and iron or hand fold. From the center line, going towards the top of the fabric, measure 1/2 the length of the pillow and mark the length by folding it. Iron it or hand fold it. Measure from the center line towards the bottom of the fabric 1/2 the length of the pillow and mark the bottom length by folding it. Iron or hand fold it. Now let’s get gluing! Following the diagram below and glue the left and right sides together using the picture below as a guide. Glue a couple inches at a time laying down a continuous line of hot glue. Press the fabric together with your fingers as you go and make sure there are no gaps in the glue. Reglue if any gaps appear! You will end up with a pocket of sorts. Now fold up the bottom of the fabric stopping at the bottom fold line of the pillow. The top finished edge and some fabrics of the first pocket that was made will be covered over by the fabric that was just folded up! 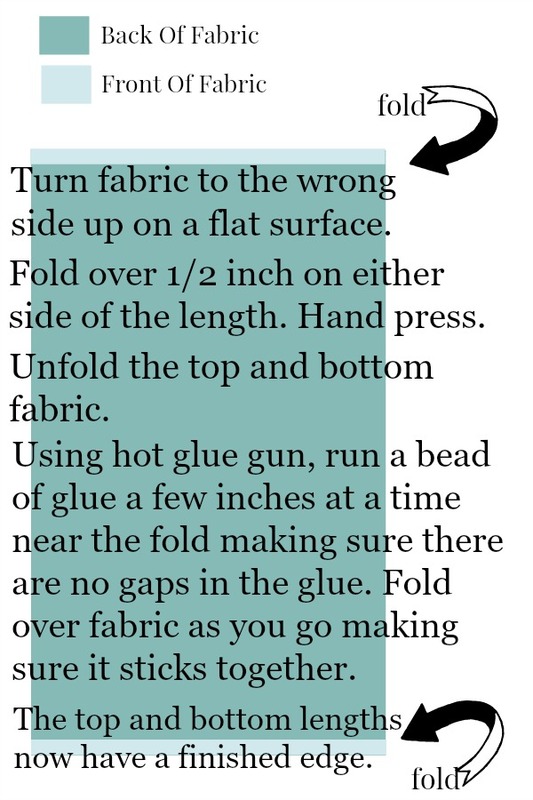 Using the diagram below glue both sides of the fabric like you did above. Now you will have another pocket. Follow the image below. Turn the fabric right side out . TA-DA! We have just made a pillow!!! So so easy and pretty! Please visit my dear blogging friends and their 10 MINUTE DECORATING ideas! You might like to follow me on Pinterest. I have a Pinterest board called “10 MINUTE DECORATING” with lots of easy to do decorating projects. You can see what I’m finding to pin every day HERE. 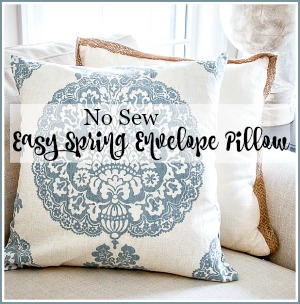 Love the idea of the no sew pillow and wonder if the directions can be printed out in a condensed version? What a great idea! I’m going to have to try this! Thanks for sharing this! I love this idea but I am really confused where I need to be folding and adding glue. Do you have a video tutorial by chance? Sorry, this tutorial is a little confusing to you. What a great idea! I’ll do a facebook live in the fall! Wow, I never would have thought of using hot glue to make a pillow! My favorite tool is the hot glue gun! Thanks for the tip. I have followed you for the last 3 years, maybe more. I have never written on a post, not sure I have anything to add. However this pillow instruction was great. I believe I may be able to do this. Thank you for this post for anyone not so talented but wants beautiful surroundings. Love the pillows!! I’m all for fast a and simple. I use table runners for quick pillows. Cut each end of a double-sided runner to desired length. This gives you two pillow covers enclosed on three sides. It only takes minutes to hot glue or fuse the remaining opening. I recently found a “French” runner with ruffles on the ends…SOOO cute! I love this! 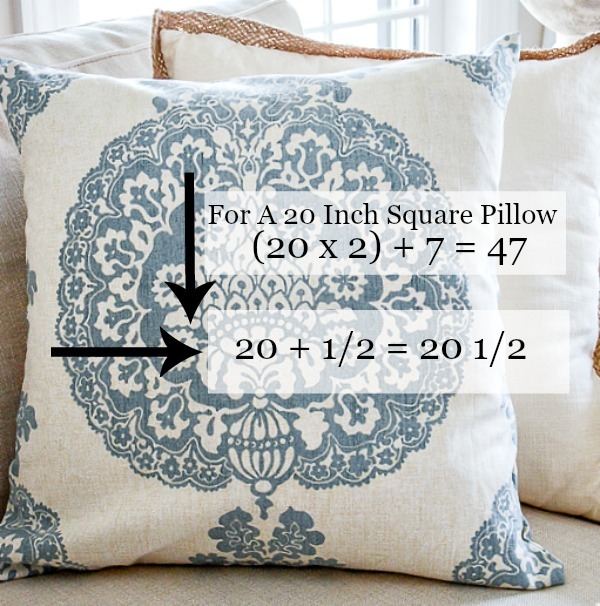 I have trouble finding pre-made pillow covers in fabric I like- this solves that problem! I have made covers with iron on hem tape, that worked pretty good, also. Will gave to try the hot glue idea! Great looking pillow! Turned out great. Glue to connect pieces of fabric? Wouldn’t the edges be sorta’ wampy? Can’t figure out how acceptable it will look w/ edges. I’ve pinned this for later to give it a try. I do have a sewing machine but I’m not the best or neatest sewer. I’m concerned about the glue though; it seems like you’d see the bead of the hot glue. Hey, it’s worth a shot though right? Thanks for the tutorial! Easy! Love it! Love this idea! Pillows are like shoes…can never have too many! Thanks! I love the fabric you used for the pillow! It is beautiful! Obsessed with this gorgeous fabric. I am all for a no sew DIY. All about that hot glue gun too. This idea is perfect for dressing up your usual pillows for Christmas or a special party, especially if you up cycle a curtain or scarf. No money spent on temporary decor. The motif on your pillow is beautiful. I have done this very thing before and my daughter made fun of me for not really sewing (which I hate)! She thought the whole idea was cheesy. Now I can send this to her and be vindicated at last! ;-) Thanks for sharing!! You are simply amazing! Awesome recipes! Awesome decorating tips… Can you please come and spread some of your fairy dust all over my home?! Boy, you can’t much simpler than this. Will have to make some. I need new pillow covers for the swing we have in the patio. Love the new podcast !! Love the no sew pillow. An easy way to go. Love, can’t wait to try. Love your pillows, so very pretty! I love the curtain fabric! Looks like it was made to be transformed into a pillow. It would look perfect on my couch. Great tutorial! Been wanting to make a pillow from some of my mom’s barely used soft pajamas. She passed away recently and I thought this would be a great pillow to snuggle up to when I’m missing her. Thank you! Yvonne, LOVE this idea since I do not have a sewing machine this is a great way for me to make pillow covers! You do have great ideas as always! I’m looking forward to trying these Yvonne! I made your woven burlap placemats today. They took me awhile but they look great……then I got to thinking you could probably come up with a DIY placemat using fabric and a glue gun! Ha! Another challenge for you! I’m sure you can come up with a wonderful pattern. I will be saving this for sure. I’ve made a few pillow covers, but I seem to struggle when it comes to make sure I am getting them the right size. I always use the sewing machine, so I’ll probably continue to do that, but it’s great to have the option using a glue gun. I love the blue material you are using! That would look lovely in our living room. 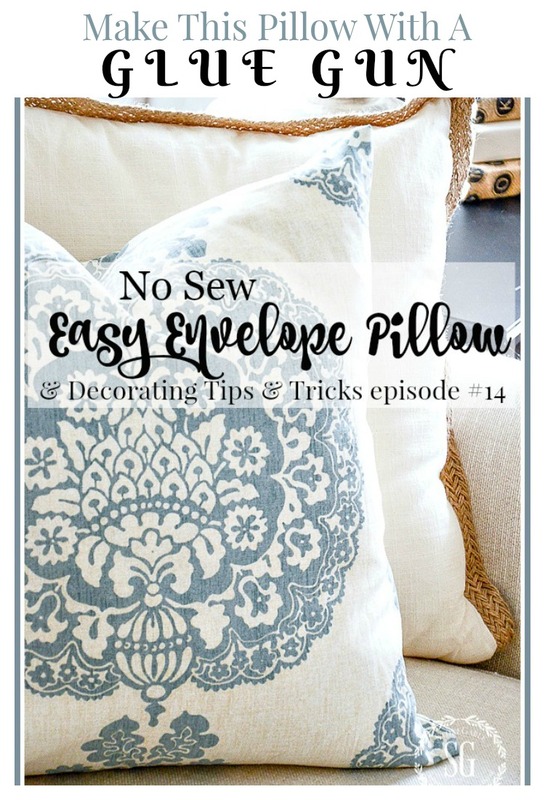 Love your easy to follow directions on how to make a pillow! Love your ideas! 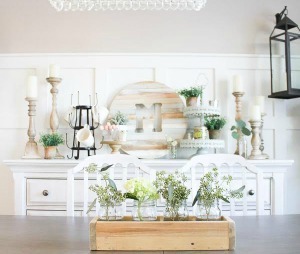 I just love this idea, also love all of your decorating! You must have a huge storage area to keep all of your seasonal decorations! 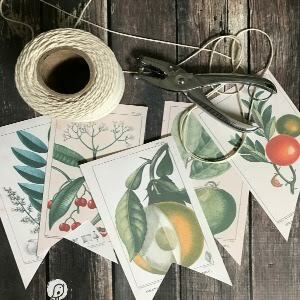 Very timely post as I recently found some gorgeous printed napkins at Pier One. Thanks for the information. Huh. I never would have thought to glue them together! I guess my only question would be — how does the glue stand up to washing? Do I have to hand wash the covers if something gets on them? 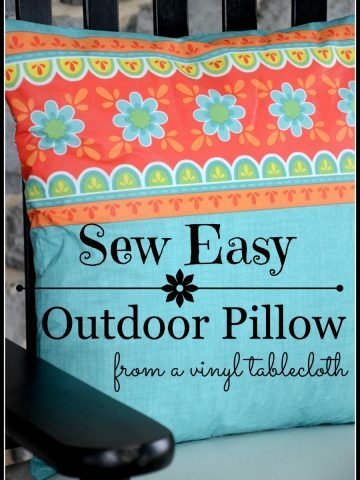 I would not have thought of gluing a pillow cover but I plan to give this a try! Thanks for the idea!! Thanks so much for this idea and instructions for a no-sew pillow. I can sew, but this looks so much easier and I never would have thought of it myself. Hopefully, I’ll use it to make some new pillows! I may even be able to do this! I have three pillows purchased at Joanns, after Easter last year, that would be perfect! Now to find the perfect fabric! Although I can see and I have a sewing machine, sometimes I would rather not drag it out and have to take time to prepare it all. 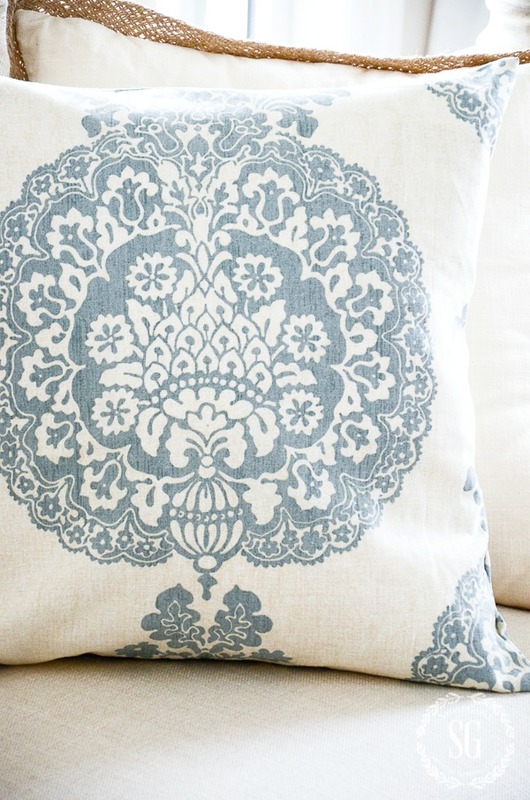 It ‘s nice to have an optional method of making a beautiful new look in pillows in a fast way. Thanks for sharing another great idea. We all need to know this! I do sew, but in a pinch…well, you know! I am going tomorrow to purchase pink light bulbs. I love, love, love the podcasts!!!!! Hi. I will study your instructions. My injury does get in my way. I used to sew so I have to think? And I do want to try. Thank you for your helpful instructions. What a great tutorial and I love that fabric! I just joined your blog a few days ago and I’m enjoying seeing all of the ideas you have for decorating. I am hoping to learn how to do some of your decorating. I like your style. Welcome to the StoneGable family, Mary! Fire up the glue gun ! Love the “fabric” it makes a great pillow ! I have been sewing most of my life. The one thing I really hate to sew is pillows! Not sure why but I just do. this is way easier and turned out lovely. Thanks for the tip. These pillows should be fun to make. Thanks. Thank you for the tutorial. The pillows are lovely. Great ideas. Love your home. How are you feeling now ? Thank you for the great step-by-step instructions! Can’t wait to try it. I’m glad you made a glue seamed pillow. I’ve wanted to try it out but I can see I it works just fine! I saw above in another comment that you used a saved curtain from your stash for the fabric for your pillow. That was to be my question! I love the fabric! I have a stash of fabric which includes some single curtains, so you’ve nudged me to get out that crate and start looking! I’ve been enjoying the podcasts with you, Anita, and Kelly! I always recognize your voice, but sometimes it’s hard to tell Anita from Kelly! The glued edges won’t come apart when you try to stuff the pillow form in? I am a Sewist and have never tried anything like this. However, I don’t have much time to sew these days and this is a strong possibility, particularly for decorative accent rather than heavy use. Now….where is that glue gun? Enjoyed this post very much. I too, love to decorate with pillows! I love your idea and your directions were fabulous. I usually use sewing machine for such things but nice to know there are alternatives. Who knows–my machine might be in the shop for a week and now I could get this kind of thing done without the machine. Thanks a lot! A lovely fabric…. makes me think of curtains differently. Next time I’m at thrift shops I’ll look in the curtains for pillow fabric! Easy Peasy! You make everything looks easy. I have made many envelope pillows but never thought of using glue. Awesome idea! Thanks for providing such detailed information. I don’t have a sewing machine, so this appeals to me. Very smart! It’s a beautiful pillow. Thank you for these gift card giveaways. Love all your posts on pillows. Such an affordable way to change out the look each season! BTW, you sure had a GREAT idea for upping the number of comments to your posts. I’ve noticed you now have scads more of us dropping by with a comment since you started offering the monthly $100 visa card contest! Very smart of you! Yvonne great idea. The only problem I have with a glue gun is that I am always burning my fingers. I see myself trying to smoothe the edges and then burning the tips of my fingers. I seem to be all thumbs.Any suggestions? I use the end of an old spoon, Eileen. The hardened glue is then easily removed (from the spoon) with your thumbnail. Great idea to use a glue gun, I’ll have to try it! Have glue gun plus your great instructions, new pillows in my future now. The simple glue gun just got a promotion and may be heading for a greater use in my life. Thank you for these instructions. May have to try this one day. Hope mine turn out as pretty as yours. 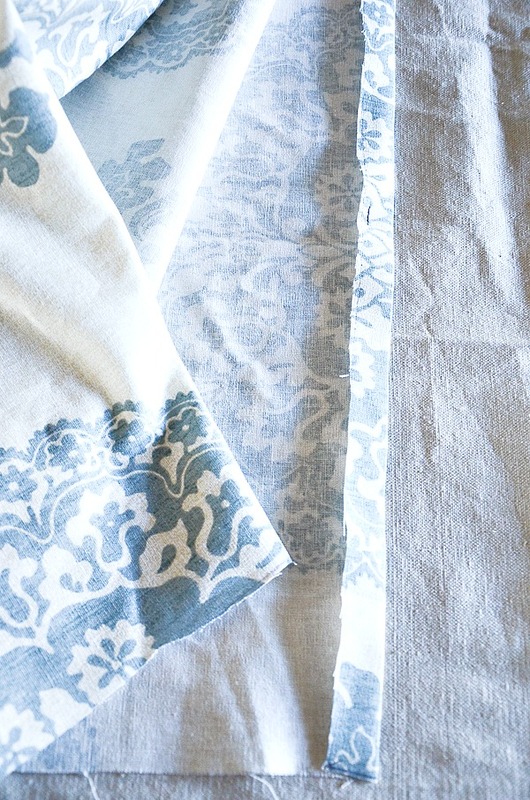 Pretty Fabric from your curtain! Thanks for this great idea. Reminded me of my first date. My mom running late, put the hem of my semi formal dress in with iron on tape. That pillow fabric is beautiful. Thank you for sharing a DIY. I really like that idea of using my hot glue gun. I really love these pillows!!!! I’m planning on making 4 for my bed, and about 8 for my couches!!! I’m ready to do this!! Thanks so much for the instructions Yvonne! I love it!! Love Stone Gables posts! I learn so much! My husband jokes that our whole house is held together with hot glue. Now I can add pillows to the list! I enjoy the podcasts so much. 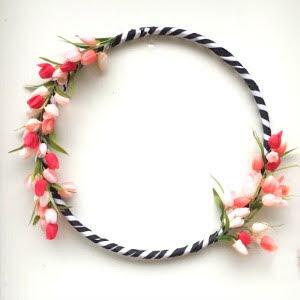 Pretty, but how does it stand up to everyday wear & tear? Seems like you would be able to feel the bead of glue, I’ll stick with my sewing machine!! No sew is my kind of project. I’m allergic to the needle and thread due to a mean home economics teacher in high school way back in the day. Great tutorial! Thanks! Love your fabric! Thanks for the pillow pattern love it. I love this idea! I keep thinking I’ll set up my sewing machine, and make some pillow covers, but I’m just too lazy to do so. Glue guns and the ironing board and iron are much easier. It’s amazing how just changing out your pillows can change the whole mood of a room. Thank you for the ideas! I love the idea of repurposing the curtain. Love the fabric/curtain you used. Lovely! I have a pillow that needs a new cover. I’m going to do this! Thanks for the tip. Brilliant! As I refresh for spring I am definitely trying this. The instructions are very detailed so I believe that I can make a couple. I love the idea of using some drapery fabric. I do have some and this is a very good way to use them up. Thank you – this looks to be a very doable DIY project. You make it look so easy. I need new cushions for my porch furniture so I’ll be looking for some spring fabric. I love no saw projects! Easey peasey is so very right. I follow lots of blogs but you are definitely one of my favorites. Thanks Yvonne! I’m going to make some. BTW my sister always does her upholstery projects with a hot glue gun. She says it holds up very well. What a wonderful idea! Please tell us where you purchased the fabric. It was an old curtain that Yvonne had held on to. The treasures we can find in our stash. Love it! Definitely trying this!! Awesome tutorial! Can’t wait to try it! Thanks, Yvonne! I love your pillow ideas/posts! Yvonne, I love the fabric you used for the pillow, just gorgeous! Thank you for the very well written and illustrated tutorial, I am excited to give this a try with some of my stashed fabric. Thanks for the idea! I could do that. Your ideas are always so inspiring! 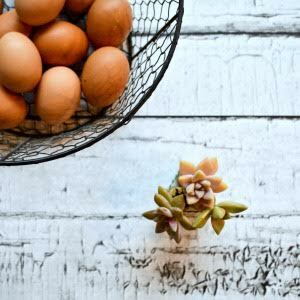 This is one that I will definitely try – its time to do a spring spruce up at my little house. Where is a good place to get pillow forms? Keep those ideas rolling – its always fun to see your decorating tricks and treats! Great use of beautiful old fabric. I love your posts and reread them all the time. I’m definitely going to make a pillow with hot glue! Thanks for the great idea. I have some curtains that would be great for this project. Yvonne…another great trick to easy decorating…Thanks. Love the pillows! I’ll have to give it a try! So pretty! I love everything about StoneGable! Thank you for this tutorial. I will definitely be making this and saves me from hauling out sewing machine. I’m impressed Yvonne with your glue gum pillow cover and the awesome tutorial. I like the idea of recycling your curtains as pillow covers. Happy March 1st! Fabric and glue gun ready. Here I go! I never thought of this but will be giving it a try soon. Thanks! Great alternative to sewing. As always, I love reading your post, so many great ideas. Great idea! Love the fabric! I am not a sewer …I know how, just am too impatient to wait for the results. This option is marvelous for all of us impatient non-sewers! Thanks for sharing this and giving the ladies and gents in this category such a great option! Look out pillows …HERE WE COME!!! The no-sew pillow is such a great idea for a craft day with my young granddaughter! Safe, quick, and doable! Perfect for her upcoming birthday. Thank you, Yvonne, for your constant inspiration! Love, love, love this!!! I do not sew, but I can use a glue gun! Thank you so much for sharing! You have given an option to nonsewers, but I struggle more with hot glue and its strings than I do with my sewing machine. Love this idea!! Your pillow looks wonderful! 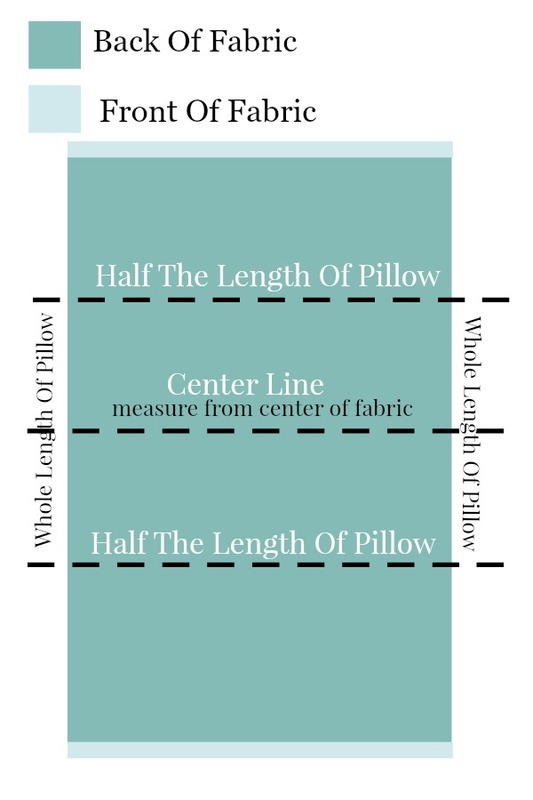 Love the instructions for measuring the fabric for the pillow. I have a sewing machine so will sew the seams but I have trouble figuring out size to cut without a pattern. Your instructions for measurements will be very helpful. I love the burlap pillow! I only subscribe to two blogs and enjoy reading both yours and the other with a hot cup of tea first thing in the morning. A very pleasant way to start my day and wake up slowly. Love the idea and great for people that don’t sew. I am blessed that I can sew but great idea for those that can’t. Love the idea of old drapes for doing pillows, I love going to estate sales so I will start looking . Thanks for the idea. Fabulous instructions. Thanks for taking the time to do those detailed graphics. Appreciate it! Love repurposing items, pretty fabric. I’ve been wanting a change in pillows for the impending warmer weather but no longer own a sewing machine. I’ll definitely give glue a try and am wondering how well it holds up when inserting/removing the pillow form for laundering. Do you have to reapply the glue? I’m also wondering, Yvonne, if my “December win” is in the mail yet? I’ve emailed you a number of times but, so far, received no reply. I was so excited to be declared a winner as it was the first time I ever won anything. I do feel that your Reader Appreciation Giveaway should stipulate it’s not applicable to Canadians. Couldn’t be much easier.I like the pattern. 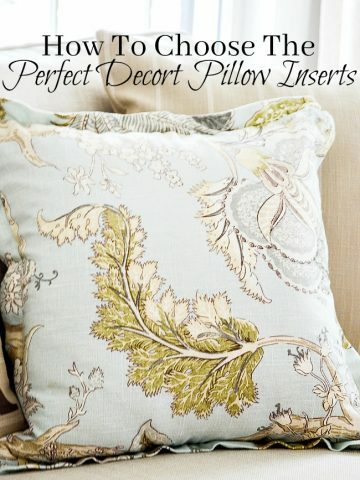 What an easy and inexpensive way to get new pillows! Thanks! Fun idea! 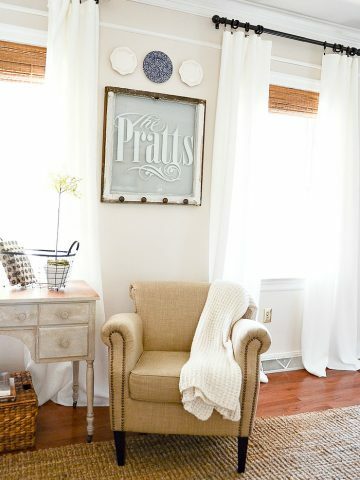 Love the re-purpose idea of using a favorite window treatment. I look forward to reading your blog each morning! I need some new pillows for my sofa and porch bench so I think I’m giving this idea a try this weekend. Will let you know how I do! Thanks for all of your ideas. I have never considered making a pillow cover using my glue gun. Genius! 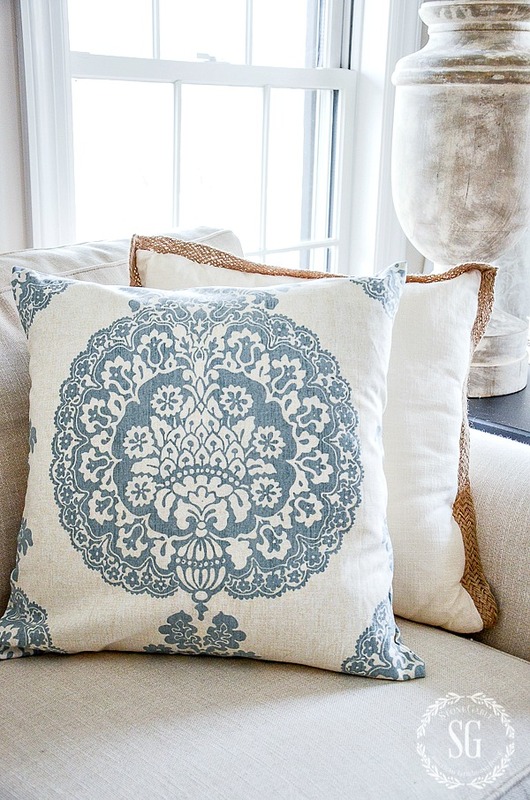 I love the fabric on the blue and white pillow, but the white one with the burlap edging is my favorite. For some reason I love burlap. I can now have different pillows for all seasons without spending a fortune! How do the pillows hold up if you wash them? I love the idea of using glue. I’m not sure. I probably will not wash this one. Thank you for the instructions on the no-sew pillow! Love how it turned out. Looks simple will have to give it a whirl. Wouldn’t iron on hem tape work too in place of hot glue? I think it would leave a crisp hem and you wouldn’t have to worry about too much glue in places. Interesting, I would like to see the back of the pillow too!! So easy peasy. I am going to try this. I’ve been putting off making a couple of pillows, but this looks like it will be a fast way to do this. Thank you! You know what I love even a tiny bit more than the pillow tutorial?!? The idea you just sparked in my head of repurposing some of those curtains I have been saving! One of my goals in decorating our new home has been to bring new life to things I already have, and you have been such an instrumental part in giving me inspiration. Thank you! thanks for the great pillow idea! I have made the envelope pillow several times using a sewing machine. Good to know that a glue gun will work in a pinch. This pillow form gives a great bang for the buck. I had a watermelon themed party last summer and wanted watermelon pillows, but of course I wanted them on the cheap. I made several pillow in red twill. I used my Cricut to cut black vinyl seeds (tear drop) and placed them on the fabric. They looked great and unless one was right upon them, she couldn’t tell that the seed were stuck on. Thanks! Thank you that was a great explanation of how to make no sew pillows! I’ve been making glue gun pillows for literally years now, and they’re still going strong!!! I love this! I think even I can do this one! Thank you for showing us the simple, beautiful, and cozy pillows even the DIY challenged can do! Beautiful pillow Yvoonne. I will definitely try making this, as I had a fight with my sewing machine and kicked it to the curb!!! me to do go ahead and give it a try! Thank you for the I inspiration! Yvonne…this seems really confusing. I make envelope pillows ..yes I sew it on my machine..looks really professional. Nice to know another way, but I will stick with my tried and true sewing machine. You are very blessed that you have a sewing machine and know how to sew. Many of my readers don’t sew. So this post is to give them another option. What a great ‘the light bulb came on’ idea. It is something I am going to try on some curtains to add a bit of contrast to the bottom of a pair in the dining area. Better stock up on glue sticks. Yvonne, thanks so much for this tutorial. It’s the kick in the pants I need to get started on pillow covers for my sofa. But since I have leftover fabric glue (Fabri-Tac) I’m going to use that! I was wondering if I could glue a pillow cover that would still look beautiful and not amateurish. I see from your photos it looks just as good as a purchased cover. Thanks for giving me confidence to go ahead with this project. love this idea and will definitely try this one. thanks for making my decorating easier! Wow,that’s great! Your pillow looks awesome! This is fantastic!! Can’t wait to get started! You are so creative. Off to make one of these. Thanks for sharing. Great idea!!! I will definitely try this! !